Living Goods works to reinvent how we improve the lives of the under-served. We think big, but operate lean and nimble. 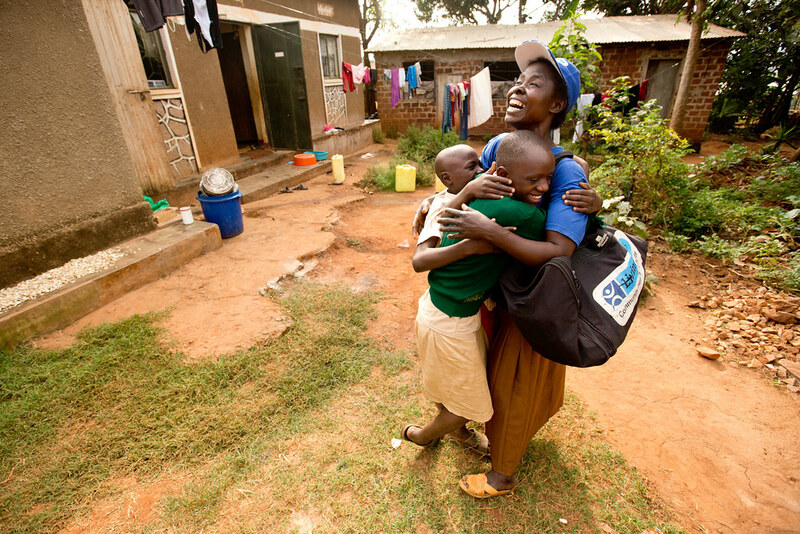 We train community health workers to bring life-saving products and health services to families’ doorsteps. Services like prenatal assessments and well-baby visits. Products like medicines, fortified foods, and modern contraceptives. We also empower community health workers through mobile phones. We teach them how to detect and treat common illnesses like pneumonia, malaria, malnutrition, and diarrhea. We develop smart phone apps to guide home visits and create predictive algorithms to make the best use of community health workers' time. And we test new cool tools like paperless referrals to clinics and biosensors to monitor infant and child growth. At Living Goods, you will have the chance to apply your ideas and creativity at work every day. If you work well in a dynamic collaborative culture, set high standards, and meet challenges with determination and a sense of humor, you’ll thrive here at Living Goods. mHealth is the biggest health transformation of our lifetime. All around the globe, mobile phones are making a difference between life and death. They allow families to call for medical help in emergencies, help rural pharmacists locate lifesaving drugs during stock outs, and enable health workers to track potential pandemics. In developing countries, mobile phones have also transformed community health at the grassroots level. Living Goods is rapidly transforming into a digitally-led business in order to better serve our communities and other stakeholders. Our belief in the power of technology, mobile phones and phone apps is not unique. Nowadays, everywhere you look healthcare executives and Ministry of Health leaders are talking about mobile health. But at Living Goods, we’ve done more than talk. We have created tools, fine-tuned them, and used them to equip over 9000 Community Health Workers and hundreds of supervisors to deliver high impact, low-cost community health services.We truly believe using data for decision making is transformative. We now want to take it a notch higher by strengthening our Technology team to enable us to customize and build high performance and scalable mHealth systems. As such, this is an excellent opportunity for a driven candidate to take on a leadership role where you would be committed to building and maintaining a highly productive software engineering team instilled with the ethos of delivering quality solutions. In return, you will enjoy an exciting, innovative environment that supports flexible and agile working. You will lead the engineering team and work closely with operational managers and high-level staff in multiple countries. You will support the CTO in developing and delivering the overarching technology strategy and setting the direction for the software engineering and operational teams within the organization. Since technology is central to what Living Goods does, you will contribute to the global organizational strategy and contribute to the technology team transformation strategy and future direction. Provide leadership oversight of 10+ software engineers, including employees, contractors, and third-party partners. Participate in strategy conversations the organization in general and technology in particular. Develop an understanding of organizational goals and requirements, and develop a vision to translate those requirements to the technical end-product. Work in alignment with project leadership and internal & external stakeholders to deliver projects on time, with high quality, and that meet client needs. Partner with cross functional teams, stakeholders, product owners, and operational managers to deliver software solutions in alignment with organizational objectives. Be the team’s representative among senior and project leadership, effectively managing upwards and downwards. Develop and deliver regular communication including software delivery status and risks to senior management. Determine appropriate work load for engineers and develop engineer’s skills in alignment with their career goals and organizational future needs. Has a strong Software Engineering background and deep knowledge of agile development practices, TDD/BDD, automated builds, continuous integration, Cloud & container infrastructure. Has experience across the entire software development life-cycle from inception, through build to production. Is an experienced leader who has built effective teams that deliver results across the organization; technical experts, managers and future leaders. Has confidence to express own opinions, and pragmatic about modifying them when appropriate. Has the desire to learn and evaluate new technologies for cutting-edge solutions. Collaborate with senior engineering staff to define and implement reliable, scalable, efficient and secure architectures operating in a cloud environment. Create and execute key strategies to meet business outcomes and manage strategic relationships. The ability to lead and influence C-level stakeholders. Deliver high quality, high availability, highly reliable, scalable, and secure systems. Lead the architecture, design, implementation and deployment of products, working with project teams to ensure effective translation of requirements into technical specifications, delivery of products to schedule with high quality. Define and manage the entire software development lifecycle in an agile delivery environment focusing on continuous deployment at pace while maintaining quality and performance of software systems including supporting systems in production, responding to production incidents and managing unplanned work. Grow, mentor, manage and inspire a growing team of software engineers, providing clear and constructive feedback and creating opportunities for learning and growth. 12+ years of software engineering experience with a focus on high performing, innovative/creative and consumer-facing application and platforms. Previous hands-on experience developing web/mobile applications, transactional platforms from requirements gathering to delivery and support. Proven ability to efficiently manage all aspects of the software development lifecycle in an Agile environment particularly multi-tier data-driven applications. Comfortable with integration, extension and modification of open-source tools. The ultimate measure of success is working software in production fit for now and the future, and a team that is continually challenged, motivated, mentored and supported where necessary. So, if being at the cutting edge of technology for development in health appeals and you have the background and skills, we are looking for then get in touch, we would be keen to hear from you.